BEIJING — The head of the Catholic church in Hong Kong has expressed optimism that the Vatican and Beijing can overcome the controversial issue of bishop appointments lying at the core of a decades-long dispute. 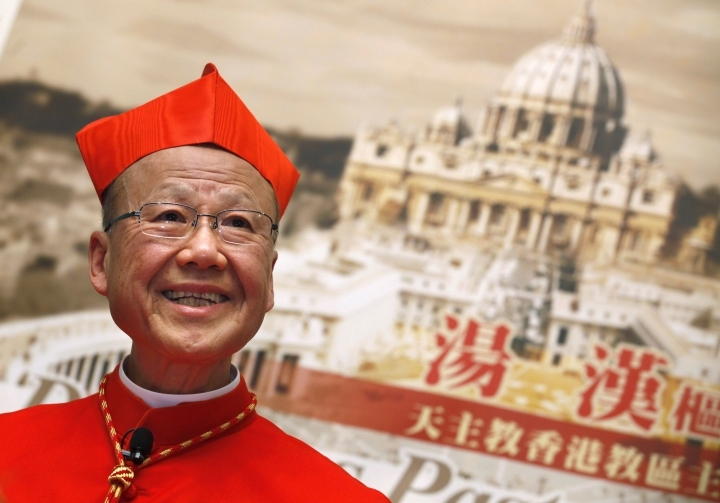 Cardinal John Tong said in a lengthy essay published by the Hong Kong diocese that a "preliminary consensus has reportedly been reached" on the matter, and suggested that the pope could retain veto power over the ordination of mainland bishops under the new arrangement. China's officially atheistic Communist Party cut relations with the Vatican in 1951 and ordered Chinese Catholics to take their orders only from Beijing. The two sides have been negotiating on a resumption of ties, but a major stumbling block is Beijing's insistence that a party-controlled body have the authority to appoint Chinese bishops, a power the Holy See says belongs to the pope alone. "The dialogue between China and the Holy See implies that changes have already taken place in Beijing's policy on the Catholic Church," Tong wrote in the Hong Kong diocese's Sunday Examiner publication last week. "It will now let the pope play a role in the nomination and ordination of Chinese bishops. Beijing will also recognize the pope's right of veto and that the pope is the highest and final authority in deciding on candidates for bishops in China." Diocese spokesman Fung Yat Ming said Friday that the cardinal was not available for comment and clarified that Tong's post reflected his opinion and was not intended as a progress report on the negotiations. Still, the Hong Kong bishop's writings have been closely followed by the Catholic world for hints about the contours of any emerging Sino-Vatican deal. Tong disclosed in August that the Chinese government was "willing to reach an understanding" on the issue of bishops. A number of government-backed bishops have been ordained in past years without the pope's approval, straining ties between Rome and Beijing. The community of as many as 12 million mainland Catholics is split between those who follow state-authorized churches outside the pope's authority and those who attend underground churches that swear fealty to the pope — sometimes at the risk of persecution. Pope Francis has repeatedly made clear his desire for rapprochement with Beijing. The Communist Party has long expressed wariness toward religious organizations and perceived foreign influences that could undermine its authority. The country's head of religious affairs Wang Zuo'an said in December that Beijing was open to constructive dialogue with the Vatican but only if China's Catholics "hold up high the flag of patriotism" and adapt Catholicism to Chinese society.